A workhorse Soyuz booster thundered to life and climbed into a dark Kazakh sky Friday, carrying NASA astronaut Scott Kelly and cosmonaut Mikhail Kornienko on a four-orbit voyage to the International Space Station to kick off a marathon 342-day mission, the longest flight ever attempted by an American. With spacecraft commander Gennady Padalka strapped into the command module's center seat, flanked on the left by flight engineer Kornienko and on the right by Kelly, the Soyuz TMA-16M rocket's main engines ignited with a roar at 3:42:57 p.m. EDT (GMT-4; 1:43 a.m. Saturday local time), pushing the booster away from the Baikonur Cosmodrome in Kazakhstan. 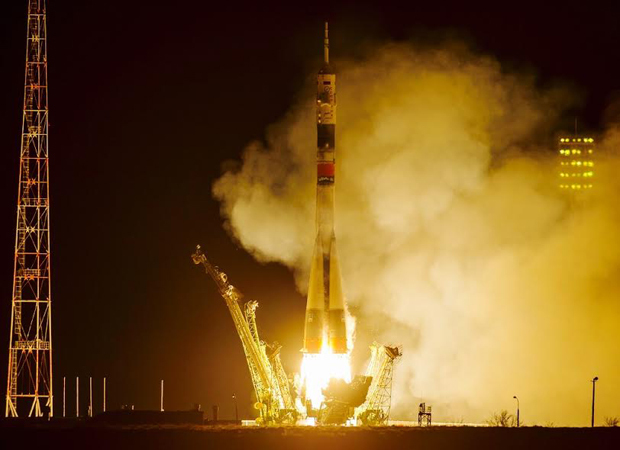 The International Space Station passed 260 miles above the launch site just a few moments earlier and after a smooth eight-minute 45-second climb to orbit, the Soyuz spacecraft was released from its upper stage booster, solar wings and navigation antennas deployed and the crew set off after its quarry. "Good luck, Captain. Make sure to @Instagram it. We’re proud of you," President Obama tweeted from his White House account. Added First Lady Michelle Obama: "We have liftoff! @StationCDRKelly just launched for the @Space_Station on his #YearInSpace. Good luck, Captain." The autonomous rendezvous went smoothly and Padalka, one of Russia's most experienced cosmonauts, monitored a picture-perfect docking at the upper Poisk module at 9:33 p.m. Two hours later, after extensive leak checks, hatches were opened and Expedition 43 commander Terry Virts, cosmonaut Anton Shkaplerov and European Space Agency astronaut Samantha Cristoforetti welcomed their new crewmates aboard with hugs and handshakes. The combined crew then floated into the Zvezda command module for a traditional video conference with friends and family standing by at Baikonur. "I have just one reminder for you," said Kelly's girlfriend, Amiko Kauderer. "Good company, on a long journey, makes the way seem shorter. That's for you and also for your brother, Misha (Kornienko)." "Yeah, that's right," Kelly agreed. "We're going to be up here a long time, but I couldn't be doing it with a better guy." Kelly's twin brother Mark, a retired shuttle astronaut who will participate in medical research on the ground throughout the mission, said the Soyuz launch was "pretty impressive." "It was really impressive from the inside, too1" Scott replied from orbit. "I think you guys walked out of that building (crew quarters) about 11 hours or so ago, and it's pretty incredible that in 11 hours, you can walk out of a building and be where you are right now," Mark said. "Yeah, and still be awake!" Scott quipped. Padalka will return to Earth in September, becoming the world's most experienced spaceman in the process with 878 days in space over five missions. 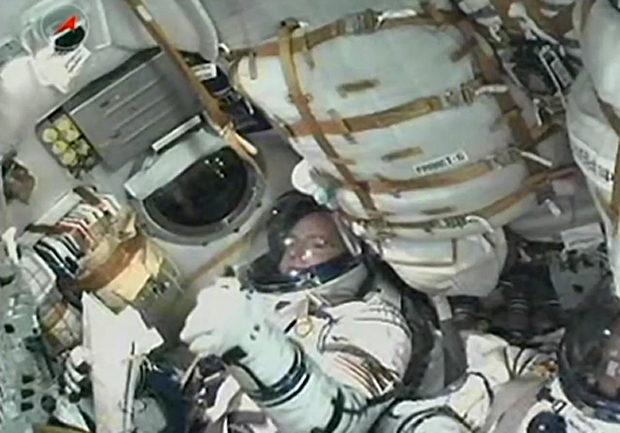 Kelly and Kornienko, both space station veterans, will remain aloft until March 3, 2016, logging 342 days in space. Four Russian cosmonauts -- Valery Polyakov, Sergei Avdeyev, Vladimir Titov and Musa Manarov -- participated in flights aboard the Russian Mir space station lasting between 366 to 438 days, but the last such flight ended in the 1990s. Kelly and Kornienko will be the first ISS crew members to spend nearly a year in space and Kelly will set a new endurance record for American astronauts. The primary goals of what NASA calls the "One-Year Mission" are to carry out a battery of experiments to learn more about the long-term effects of weightlessness and space radiation beyond the protection of Earth's magnetic field, research considered crucial before astronauts venture beyond low-Earth orbit for eventual flights to Mars. "This is not Russia's first venture having people stay in space for a year or longer," Kelly said Thursday. "But ... this is the first time we're doing it as an international partnership, which is what I think is one of the greatest success stories of the International Space Station. "Furthermore, although Misha (Kornienko) and I are only one data point in this goal to have people live and work in space for longer periods with the hopes of someday going perhaps to Mars, you've got to start somewhere. I think this is a great start, and I'm proud to be a part of it." Kelly and Kornienko will participate in a wide range of experiments to monitor the physiological effects of space travel as well as the psychological impact of an extended flight in a limited, closed environment far beyond family and friends. As an added bonus, Kelly's twin brother Mark, a retired shuttle astronaut, will participate in similar experiments on the ground to provide points of comparison. Scott Kelly is a veteran of two shuttle flights and a 159-day aboard the station in 2010-11. He said his primary concern is pacing himself and keeping on an even keel as the days turn into weeks and the weeks into months. "I'll be able to do this," he told reporters in January. "Now, whether I'll be able to do it at the same pace and with the same mood and feeling the same way at the end, I hope, I don't know. But I think I was pretty consistent throughout (my last) flight in how I dealt with my fellow crew members, folks on the ground with regards to how I was feeling, fatigue levels, things like that. I think I'll be able to carry that through for a year." Talking to reporters Thursday, he said his goal is to "get to the end with hopefully as much energy as I had at the very beginning." Kelly and Kornienko will be on board during one of the most extensive space station reconfigurations since the shuttle fleet was retired in 2011. Two new docking adapters will be installed, along with required wiring and other equipment, to pave the way for eventual dockings by commercial crew capsules being built by Boeing and SpaceX. As part of that work, a storage module will be robotically moved to free up a berthing port for unpiloted cargo ships, and a docking port extension will be moved to serve as a base for one of the new docking adapters. Three spacewalks were carried out in February to install wiring and antennas and four more will be required to finish the work, including at least one by Kelly. During their stay on the station, Kelly and Kornienko will be members of four different crews, joining Expedition 43, already in progress, and transitioning to Expeditions 44 in May, 45 in September, and 46 in November. 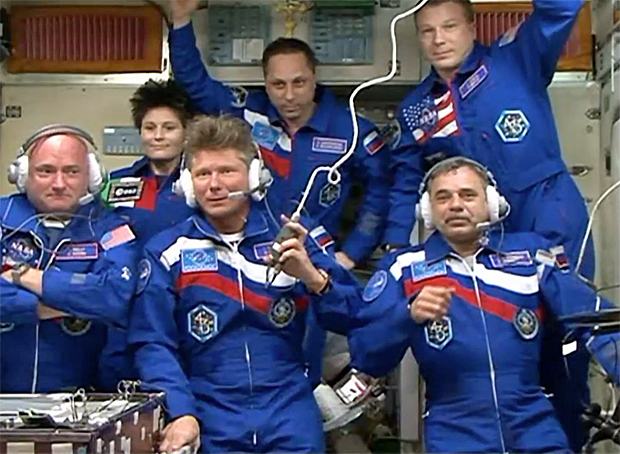 Padalka will command Expedition 44 while Kelly will be in charge for Expeditions 45 and 46. Because of the One-Year Mission, Russia's normal Soyuz crew rotation schedule has been modified. On Sept. 1, a Soyuz ferry craft will carry just one full-time crew member to the station -- Sergei Volkov -- along with two short-term crewmates: European Space Agency astronaut Andreas Mogensen and singer Sarah Brightman, the 10th "space tourist" to visit the space station. Brightman and Mogensen will spend just 10 days aboard the station before returning to Earth Sept. 11 with Padalka.